In 1992, Kyouryuu Sentai ZyuRanger (Dinosaur Squad Beast Ranger) aired on TV Asahi in Japan. One year later, an Israeli TV producer named Haim Saban took the footage from ZyuRanger, cut out the Japanese cast and stories, and replaced them with “cool” American actors and stories. The result was Mighty Morphin Power Rangers. This ”Power Rangers” jazz was a huge success with American kids straight away. And why not? It was capitalizing off of a show that had been perfecting the art of firing lasers at aliens since 1975. 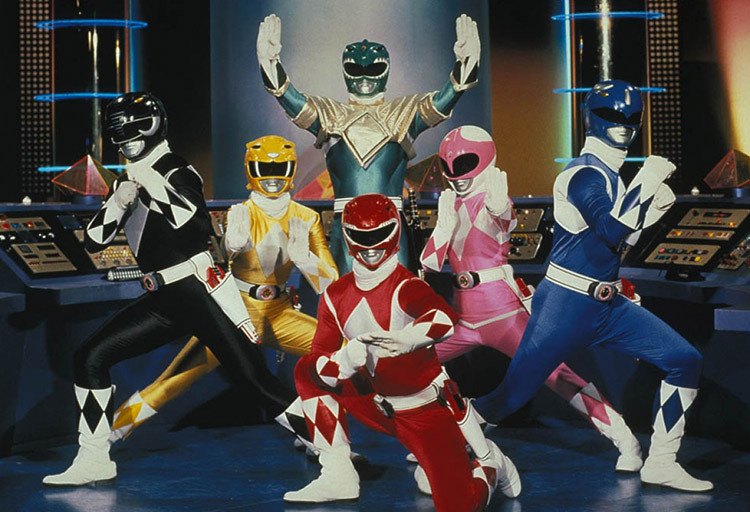 However, few people at that time, myself included, had any idea that there was anything foreign about the Power Rangers. 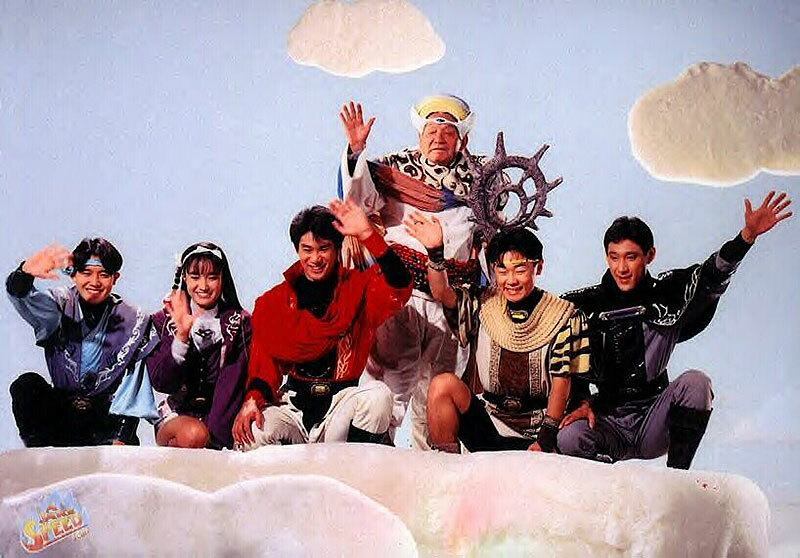 As I grew up and left this childhood show behind, I eventually discovered the show from whence it came, Kyouryuu Sentai ZyuRanger, and watching it was a total mind bender. The monsters and costumes in ZyuRanger were cemented in my brain as mine, but the stories surrounding them were unfamiliar territory. Gone were the twenty-year-old teenagers of the American iteration, replaced with characters and plots that were actually…interesting! Or at the very least, weird. But how do these two series compare? What was changed when the show was brought stateside? Remember, Mighty Morphin Power Rangers wasn’t your average localization. It was a re-filmed, re-edited Frankenstein project. So a lot was changed, not necessarily for the better. The only way to properly explain is with a side by side compari-battle! Two shows. Five categories. One survivor. Which campy children’s TV show deserves your fanatical devotion? 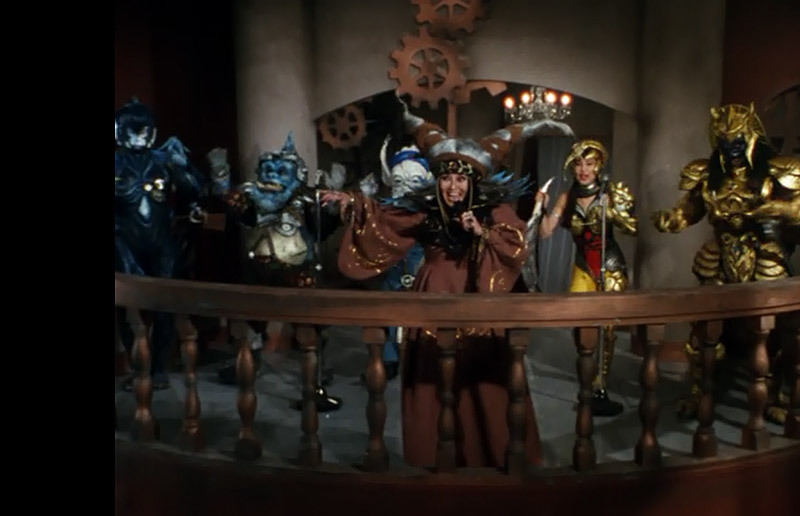 170 million years ago, five god-like robot dinosaurs sealed an evil witch, Bandora, in a comet and froze five warriors in magic tombs in case she ever escaped. She did and the robo-dino-gods revived the five warriors, bestowing them with five dino bucklers, legendary weapons, and control over the robo-dino-gods. Their gods allowed the ZyuRangers to pilot them and give them orders, but the ZyuRangers remained subservient to their divine wills. A man named Zordon and a woman named Rita Repulsa fought 10,000 years ago. At the end of their battle, he sealed her in a dumpster and she trapped him in a tube, resulting in a bizzare stalemate. Despite having no hands, Zordon built a robot and an entire command center in the middle of California. When Rita escapes her prison, Zordon, in his ancient wisdom, chooses five teenagers to wield unlimited power, since teenagers are well known for their reliability and stable emotional states. The teens begin an epic struggle against Rita and her space monsters! Also, two bullies trip and fall into plates of food. A lot. 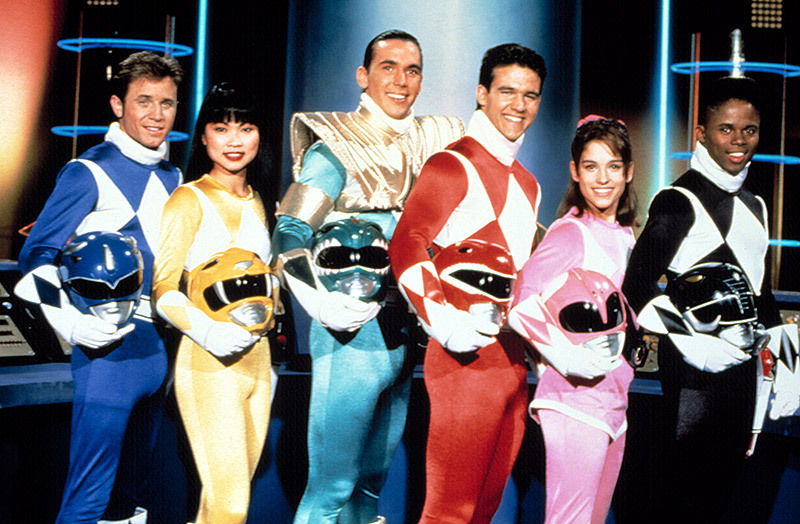 The plot of Power Rangers is a shoddy adaptation of its source material. It takes most of its substance from the ZyuRanger plot and slaps the most basic cliches from American superhero stories onto it. Average teens, chosen to have powers, ancient struggle, and so on. ZyuRanger is no King Lear, but at least it’s original. And the fact that the heroes are from an ancient time and the giant robots they pilot are their gods, which they worship, is at least strange enough to be interesting. In the J-corner, a symphonic rock ballad heralding the entrance of ancient warriors. In the A-corner, the best workout music after Rock You Like a Hurricane (totally awesome for bench press). The crazy metal riffs get my blood pumping! I am convinced that this, in conjunction with the fight footage, is what made Power Rangers so instantly popular. To this day, if I hear this song, I have the sudden urge to jump up and start somersault chopping at random, which has been unfortunate for many of my former desk lamps. I gotta give this one to Power Rangers. SPOLIER ALERT! Power Rangers isn’t winning any more categories. In the J-corner, tribal monarchs trained the art of combat! In the A-corner, charisma-free high schoolers trained in the art of study hall. Our five heroes include the average one, the tall strong one, the limber one, the serious limber one, and the girl one. These warriors of legend never back down from a fight and are friends to all children. And I do mean all children. Each episode features a different kid with a disease/fear that the ZyuRangers cure/solve at the end of each episode/show. The American heroes include the leader one, the dancing one, the science one, the gymnastics one, and the kung fu one. In the intro, it is stated that these teenagers were chosen because they had “attitude.” However, their aforementioned attitude is one of civil service and respect for authority. 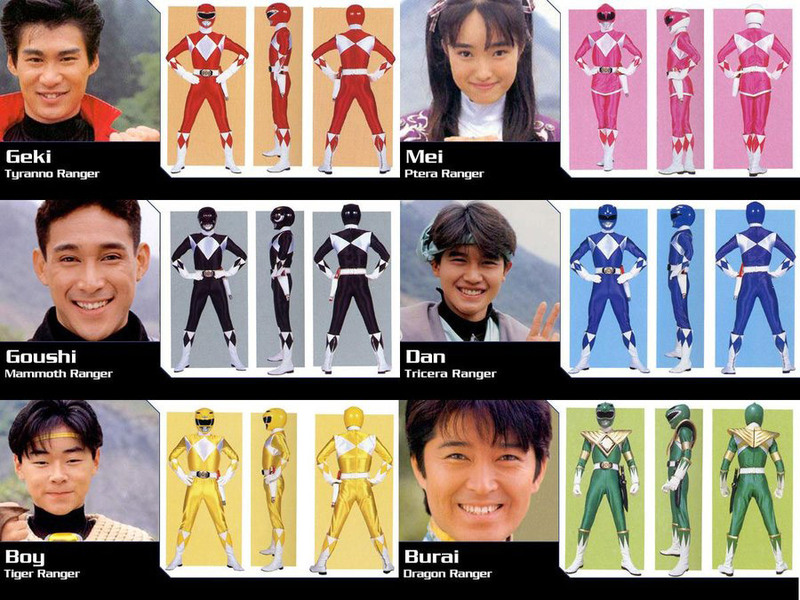 At first glance, the Power Rangers are a bit more dynamic than their Japanese counterparts in that they have racial diversity and two female characters instead of just one. They have clearly defined character traits based on their interests (gymnastics, science, etc.) But actually, that’s as deep as these characters go. The ZyuRangers, however, are very similar on the surface and have few obvious character traits or hobbies. But as the series progresses, each character gets several episodes focused on them in which they are put in tense, character-revealing situations. Again, not King Lear, but enough to show that the writers put some thought into who these characters are deep down in their squishy souls. In the J-corner, a space witch and her team of gryphons, golems, goblins, vampires and leprechauns. In the A-corner, a space witch and her team of gryphons, golems, goblins, vampires and leprechauns with annoying voices. 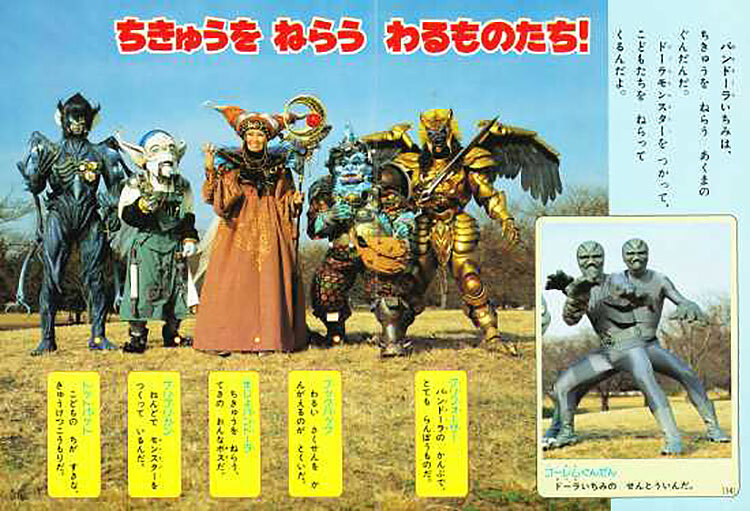 The evil side of ZyuRanger is all western mythological monsters commanded by one fantastic witch. If everything else about ZyuRanger were awful, one element would make it worth watching. Oh, and she sings her own theme song in her delightfully raspy witchy voice. This puts her high up on my list of dream karaoke duet partners, right under John DiMaggio. Each villain is the same as they are in ZyuRanger only renamed and redubbed. Poorly. Every name feels like it was the first thing the producers could think of. “That guy is gold. 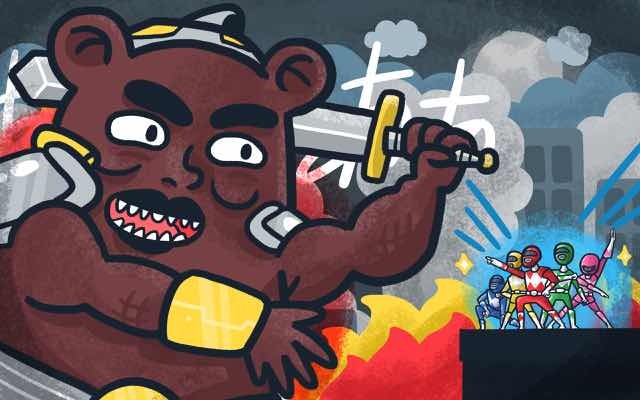 Let’s call him Goldar! This girl’s a scorpion. How about Scorpina? Genius!” Just another testament to the laziness of this localization. WARNING! THIS FINAL SECTION CONTAINS SPOILERS FOR A 20-YEAR-OLD CHILDREN’S TV SHOW!! In the J-corner, a ultra powerful older brother with a checkered past and a grim future. In the A-corner, an ultra-powerful teenager whose dedication to practicing martial arts keeps him from using it until the last minute. Bio: Hated his brother, woke from stasis to kill brother, changed his ways, fought alongside brother, discovered he had only weeks to live, quarantined in a room outside of time, only leaves timeless room when necessary. Likes: Hating his brother, changing his ways, loving his brother, solitaire. 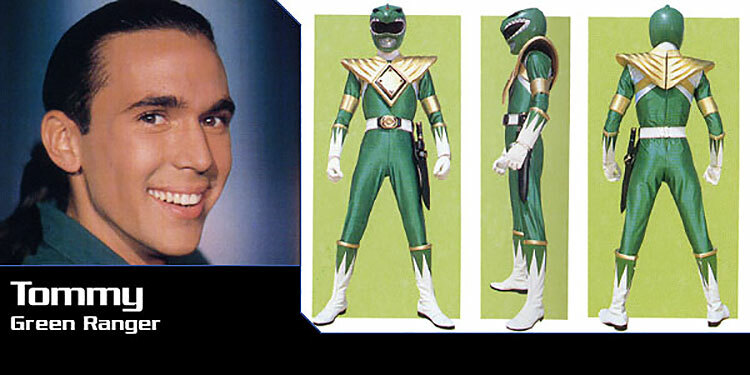 Bio: Moved to Angel Grove, got turned evil, got turned un-evil, fought alongside Power Rangers but only sometimes. The whole saga surrounding Burai doesn’t end when he finally becomes good. He finds out that he died while in suspended animation, so a weird god-boy named Clotho puts him in a Timeless Room with a green candle showing his remaining life span. Every time he leaves the Timeless Room, a little bit of the candle gets used up. 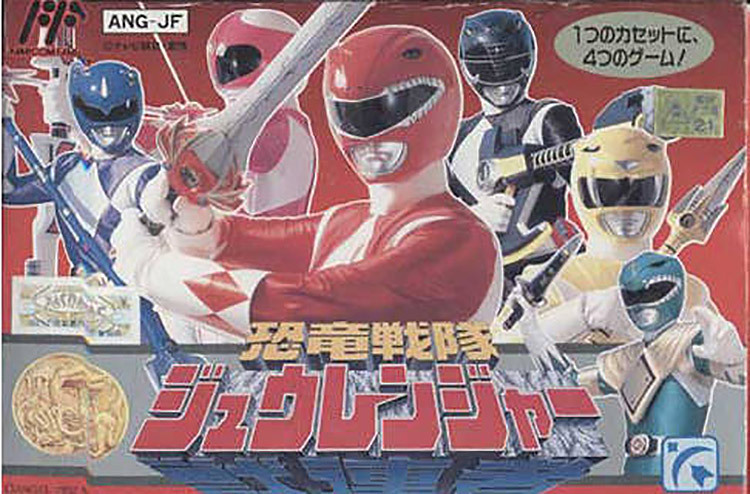 This adds a lot of suspense to the series not only in terms of battle, but also in the relationship between his brother Geki (The Red Ranger) and himself, making every moment between them brief and bittersweet. Tommy’s character, on the other hand, was at the mercy of the localization team. The drama of the bad-ranger-wrecks-up-the-place remains intact. But after that saga, Tommy becomes kind of nonsensical. If he’s so powerful, why isn’t he with the Power Rangers all the time? Because *ZyuRanger* wrote Burai as a man living on borrowed time, Tommy is forced to constantly be “out practicing martial arts” or “giving his dog a back massage” until he’s called at the last minute. None of this makes sense when a giant monster is crushing your city. If you’re still not convinced about the superiority of the Burai story, it lies in the emotional culmination of his death. After watching his life candle deplete over the course of twenty episodes, Burai decides to purposely use up the last of his life candle saving children (which he does by saving an unfortunate airborne baby!) He dies in the arms of his younger brother Geki, to whom he relinquishes his signature golden armor and flute dagger. This makes for more bittersweetness as the remainder of the series sees Geki using items from a brother he barely knew. The death is so emphasized that there is even an entire episode featuring Burai’s sentient robo-dino-god, Dragon Caesar, grieving the loss of his master as he walks alone through a poppy field. In the end, despite a letter-writing campaign from fans, Burai remained dead. But his ghost appeared at the end of the series to encourage the ZyuRangers and use his ghost magic to open a dimensional gateway for plot device purposes. 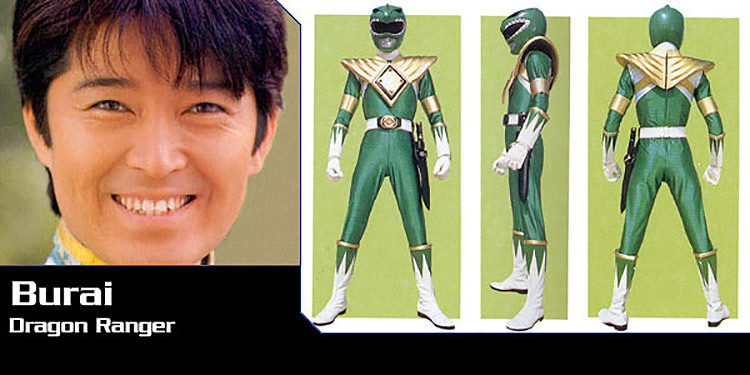 Because of the absurdity of Tommy’s motivations and the purposeful thought put into Burai’s character arc, Burai is the better Green Ranger. Sorry, Tommy fans. If you have a soft spot for Mighty Morphin Power Rangers, believe me, I understand. While screening episodes in preparation for this article, I felt pangs of nostalgia intermingled with my groans and cringing. But nostalgia notwithstanding, ZyuRanger is the clear winner in terms of overall quality. Let it be said that Power Rangers was a fantastic business venture. Saban had all the action footage and merchandising done before he started. All he had to do was fill in the blanks. But in light of this, one has to wonder, with so much of the hard work done in advance, couldn’t Saban have filled in the blanks a little bit better? The writing, especially the dialogue, is tired and contrived. It seems the show is just killing time until the ZyuRanger action footage could be inserted, leaving each episode feeling rather lazy and hollow. If Saban was as smart an artist as he is a businessman, he could have put together something truly unique and interesting using someone else’s footage. But he’s not and he didn’t. ZyuRanger is certainly campy and childish in its own way, but is thoroughly entertaining from start to finish. Even when it fails at what it’s trying to do, it still manages to entertain, leaving you watching long enough to eventually be surprised by its purposeful emotional pacing and technical attention to detail. Comparisons aside, ZyuRanger stands on its own in terms of quality. At the very least, it’s an interesting peek at another culture’s nostalgia. At the very best, it’s an intriguingly genuine piece children’s TV with a mysterious charm factor. If giant robot gods and superhero melodrama are your thing, I encourage you to give the show a try. You may just find a bit more than you expected.